Power Crunch is a high-protein bar made by BioNutritional Research Group. Unlike other nutrition bars, which are often chewy, the Power Crunch is a creme-filled wafer cookie that is not only high in protein, it is also low in carbohydrates. Knowing the nutrition information for this bar can help you determine how it fits into your meal plan. To add variety and satisfy different taste buds, Power Crunch comes in a variety of flavors, including Cookies and Creme, French Vanilla Creme, Peanut Butter Creme, Peanut Butter Fudge, Triple Chocolate and Wild Berry Creme. The nutrition information for each flavor varies slightly. Calories in one Power Crunch bar range from 195 to 205 calories. The Cookies and Creme and French Vanilla Creme bars contain the fewest calories, at 195 calories each, while the Wild Berry Creme has the highest, at 205 calories. Whether trying to maintain, lose or gain weight, it is important to monitor the number of calories you consume each day. How much you need depends on your age, gender and activity level, and can range from about 1,600 calories a day for inactive women to 3,200 calories a day for very active men. One Power Crunch bar also contains 10 grams of carbohydrates. For a balanced diet, you should get 45 to 65 percent of your calories from carbohydrates. The protein content of the Power Crunch bar ranges from 13 grams in the Peanut Butter Fudge and Peanut Butter Creme cookies to 15 grams in the Cookies and Creme and French Vanilla Creme cookies. Power Crunch bars utilize a unique whey protein called "hydrolyzed whey protein," which is designed to improve the absorption of the protein within the body, according to the powercrunch website. Whether you are trying to gain muscle or maintain your lean body mass, you should obtain 10 to 35 percent of your calories from protein for a healthy diet. One Power Crunch bar contains 11 to 12 grams of total fat, and 4 to 5 grams of saturated fat. 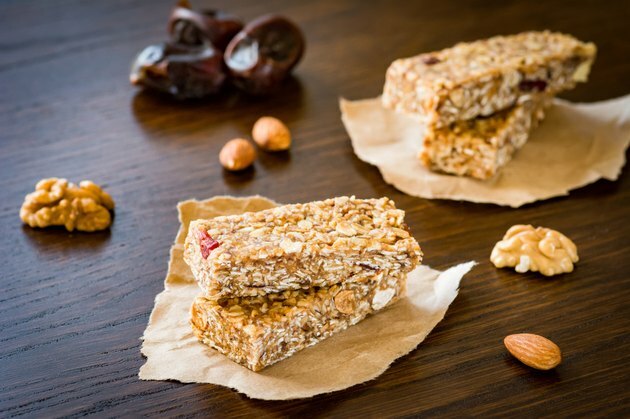 About 50 percent of the calories in a Power Crunch bar come from fat with 20 percent of the calories from saturated fat. You should limit your daily fat intake to 20 to 35 percent of your total calories with saturated fat at less than 10 percent of calories. A high intake of saturated fat can increase your blood cholesterol levels and risk of heart disease.